How is Christ the answer to a strained relationship with child, parent or sibling? What if I am being mistreated — what does the atonement say about that? How can I discover the desire to repent when I don't feel the need to repent? These are the challenging questions of daily life, the questions to which the gospel must provide an answer if it is to have living, cleansing, redeeming power. The Peacegiver is a book about the answers to these questions. In both content and form it is unlike other books about the atonement, for it unfolds as compelling story in which the characters learn about the Atonement as they struggle over the problems in their lives — problems we each share. The book therefore allows us not only to “learn about” the Atonement but also to have an experience with it. “My peace I give unto you,” the Savior declared. The Peacegiver explores in a deeply personal way what we must do to receive the peace he stands willing to give. "The only way to be happy is to live the gospel. It is not possible to sin enough to be happy." James L. Ferrell was born and raised in Seattle, Washington. He is a graduate of Brigham Young University and Yale Law School and is a founding partner of the Arbinger Institute. He has authored several bestselling books, including The Peacegiver, The Holy Secret, and The Hidden Christ. and Jim and his wife, Jackie, are the parents of five children. I had a lot to learn about forgiveness and the power our Savior and His Atonement has in our lives, for everyday moments and for the big ones. This is written beautifully and is so fun to read. It combines doctrine in a way that is so relatable to not only the situation presented but everything else in life. What a fantastic book for every married couple, as well as tidbits engaged to be married, to read together and discuss. Relationships can be difficult, but there is always One who knows us and others better than we do ourselves. The Atonement is an eternal concept which means we can always learn something new about it and this book will open the gates to a new found appreciation and wonder. As a best selling author myself, I truly appreciate this book. I even reference it in my book, Bulletproof Your Marriage. The principles are timeless and timely. Many, many couples can use this book to enhance their relationship with one another and to create a greater foundation for their marriage. Excellent book. I have recommended it to many and will continue to do so. This book is great! It has truly changed my outlook on the role of the Atonement in my everyday life. Through this book, I came to an understanding of how many ways the Atonement can be applied to one's life. I would recommend this book to any Latter-Day Saint or Christian to help gain new perspectives on several things such as forgiveness, mercy, prayer, hurt, and more. Several Old Testament stories really came to life in this book, providing biblical examples from which we can learn valuable lessons from. The references coming from the Book of Mormon show just how Christ-centered it truly is, especially for those who may not have read it. If you feel like something has gone terribly wrong in your life, no matter what the circumstances are, read this book. It can open your eyes to see what actions you should take to eventually get to where you want to go. Not to mention, the audio book is fantastic! The author does an incredible job narrating. It is great to listen to while getting ready in the morning or driving in the car. Overall, an essential read for anyone looking for a message of hope and peace. It's hard to dislike a book that is about the Atonement. I have great affection for Elder Tad R. Callister's "The Infinite Atonement" and Stephen E. Robinson's Believing Christ." But I had trouble jumping on this book's bandwagon. I love brevity and clarity. "If you can't fit your idea on the back of my business card, you don't have a clear idea," someone wrote. The Savior taught in parables—short ones. But some might enjoy book-length parables; if you are one then this book might appeal. I am not one. But the book also bothered me because of something else. In its drawn-out story, it failed to clarify the problem that plagued the two talked-about marriages. With only a very few words it could have explained that the wives in the story were frustrated by their husbands' dismissive responses to their early pleadings for change. The wives' frustration at routinely having her feelings disregarded or trivialized turns into verbal haranguing, and a vicious cycle starts, curable only by the marvelous solution the story lays out. But without that clarification, it remains a mystery why the husbands are assigned blame for their wive's verbal abuse. I think this good book could have been even better. Where it lacked is that it failed to clarify the problem that plagued the two mentioned marriages. With only a very few words it could have explained that the wives in the story were frustrated by their husbands' passive-aggressive response to their wives' early pleadings for change. (Spouses can sometimes do that — toss off their partners' pleading protests and use feigned meekness to absolve themselves of responsibility for their inaction: "She's being so unrealistic/unreasonable/impractical ... I'll just politely and humbly nod and then blow her off and do whatever I want to do."). The wives' frustration turned into verbal haranguing, and a vicious cycle started, curable only by the marvelous solution the story lays out. This book was definitely worth my time to read. It’s a short read, but contains a wealth of interesting insight and helpful advice for anyone’s life. It is enjoyable to read because it is formatted as a story, not just a book full of information. The story is of a husband and wife, Rick and Carol, who are just an ordinary couple with four children. In the beginning of the book, it explains how Rick and Carol experienced so much happiness earlier in their marriage, but years later have grown to feel unloving and unkind feelings toward each other. Throughout the story, Rick learns lessons from the Bible and Book of Mormon which help him to understand how to love Carol again and save their marriage. This requires strength and help beyond his own which he learns to find. This is a beautiful story of how one can experience a change of heart through the infinite power of the Atonement of Jesus Christ and learn how to replace anger, pride, and hate with love and humility and forgiveness. Although this is the story of a married couple and how they come to love each other again, it can apply to anyone in any situation. Forgiveness and love is something that all need to learn a little more of. I loved this book and I plan to use the information in it to better myself and learn, just as Rick did, to love everyone so much more, even those whom I don’t think it possible. I would recommend this book to anyone! I thought this book was incredible and it spoke to me. I loved the parables and examples that were given and it made me see the atonement in a different light. My favorite parable was the one with the story of David and Abigail. This book opens opens your eyes, and helps you learn to love with a greater understanding of the atonement. As I completed the novel, The Peacegiver by John Ferrell, I noticed I wanted to make complete changes to my lifestyle. I know I found comfort in this story because I could thoroughly relate to it. In this book, we walk through the story of a young man who is recently married. He talks about his ups and downs of married life and feels he is alone in the world. How often do we feel that way? The character wants to place well-deserved blame on his wife for all of his problems. Nevertheless, we learn through his grandpa that we have the choice on whether or not we are offended in any given situation. As we walk through his experience, the Atonement plays a significant role in forgiveness and charity. We, like the Savior, need to have enduring grace and peace “giving.” Ferrell expounds on how we can implement the Atonement and grace in each of our lives while telling a thought-provoking story of the life of this great man. When the main character went through all of his pain, you want to blame others for all of the difficult things that happened to him where he had no fault in acquiring. As he grows, I felt as if I grew to love all of those around me. I strive harder each day to become more charitable and loving even those that bring opposition and strife. I am going to make it a goal in my marriage as well as my single life to re-read this once a year on account of the continuing powerful affect that has taken over my heart. I recommend this book to anyone but most importantly those who are struggling with divorce debates, arguments, and even coming to know and recognize that there is a light of Christ in each person we come into contact with. For that is the goal in this life, to love as He loved, learn as He learned, and serve as He served. This novel changed my life forever. I loved reading this book! It clearly explains repentance and the meaning of the Atonement. The Peacegiver, by James L. Ferrell, provides magnificent insight to the atonement and how it applies to our lives. It is told in a parable about a man named Rick who is going through a difficult time with his wife Carol and gives readers the chance to better understand the atonement of Jesus Christ through Rick’s experiences. Throughout the course of this brilliant book, the reader can learn in plain English what it means to sin, to forgive and be forgiven, and how the atonement truly affects our lives and the people around us. The story begins when Rick receives a visit from a friend who shows him what the atonement really means. Ferrell leads the reader through Biblical stories such as the march of David to Carmel, Jonah and the whale, and Jesus’ suffering in Gethsemane. Through these scriptural experiences, Rick is taught what sin truly is and how to forgive those who have hurt him most. The Peacegiver takes the reader on an incredible journey of self discovery as they learn “The predicament of sin… is much bigger than the fact that we commit individual sinful acts. It is by so doing that we corrupt our hearts and become sinful ourselves.” Through reading of Rick’s battle of trials and weaknesses we are able to evaluate our own souls. In order to get the most out of this book one should have the Bible near. Ferrell gives scriptural references throughout the book that can give greater insight into sometimes difficult concepts. If you do not enjoy reading about someone’s problems I do not recommend this book. However, I feel that the reality of the problems is a large part of what makes this a good book. It is real. Overall this book is a life changing read. After reading it I find myself seeing the way I act and treat others with a different light. Gospel concepts that were confusing to me are now more clear and easier to teach to others around me. I would recommend this book to anyone passing through a tough time in any kind or relationship whether it is friendship, dating, family, or marriage. Everyone can apply the lessons learned from this book into their lives. This is the best book I have ever read. My life has been completely changed by the understanding of the atonement that I have gained from this book. I read it at least twice per year. Just an amazingly beautiful and powerful book that keeps giving more each time you read it. The Peacegiver by James Ferrell is a book that has the power to heal the many forms of a broken heart. The story is about a man named Rick in desperate need to save his marriage. He and his wife Carol lost sight of the love they once had and seem to be holding on to mere treads of their marriage for the sake of their children. Rick is then visited by his deceased Grandpa in his dreams. Together they journey through stories in the scriptures to help Rick see the sacrifice of the Savior in a different light. It is in his discovery that he learns how to let go of his hurt feelings, grudge, and turns to the Savior as the “peacegiver”. If you are looking for a good story in the sense of a great story line I would probably tell you to keep looking. The story line of the book is lacking in many cases because we only see quick glimpses of Rick’s life. While never really seeing how things play out step by step except for a quick epilogue at the end. However if you are looking for a greater personal insight in how to apply the atonement in your life this book will fulfill that. For anyone who is Christian, this book will make you realize that our grudges and hurt feelings are truly hurting us and increase your desire to dig deeper and change. I highly recommend this book to anyone looking for peace in his or her life. You will learn how to overcome hurt feelings as you learn deeper insights about the Savior’s atonement. It opened my heart to many realizations of the atonement that I hadn’t thought of before. This book has brought me to reflect on my own life and started a change towards greater peace. This is a great read. Loved the format for the story. It contains timeless principles that will bless you in your relationships in light of the Gospel. This book is amazing! 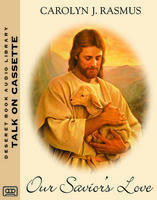 It touched my life when I needed it the most... the insight and new outlook it offers on the Atonement was life-changing. I recommend to any and all! This book saved my family! I received this book as a gift when my marriage and my family was broken into a thousand different pieces. I had so much forgiveness and understanding to find within myself to give to those I loved the most. This book taught me how to use the atonement in a way to strengthen myself and my family, even those who caused me the pain.It taught me how to give true forgiveness. It taught me how to truly give my pain to the savior. It taught me how to have peace and hope, so I could begin to heal. If you are hurting from your own poor choices or someone else's poor choices. I know that this book will be a great strength to you! I loved it and refer back to it often for strength! Grab the tissue box first! This book is wonderful. It provides an opportunity to look at things in a different way and then find the power to heal relationships. Sometimes what people need is the in-your-face approach, this book opened my eyes and made me stop and think about things. I didn't take offense to the approach, I appreciated it and how it made me reevaluate my thoughts on forgiveness. Great book!